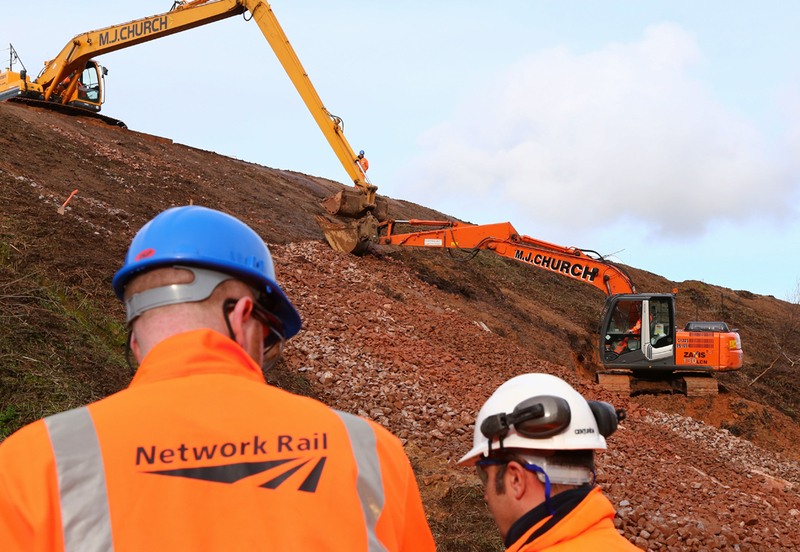 On the 4th February 2014 the railway media were invited to attend Whiteball Tunnel with Network Rail where since the 18th January 2014, Network Rail has been embarking on a complicated project to carry out works to repair Whiteball Tunnel with Amco Rail. The 1000m long tunnel built in 1842 straddles the Somerset/ Devon boarder and is located between Taunton and Tiverton. To prevent potential brick fall the tunnel lining had previously been relined with a RamArch wire mesh system two years ago; during this closure a new concrete lining has been applied to the worst areas and main crownbrick arch to prevent future deterioration of the tunnel, and improve safety. 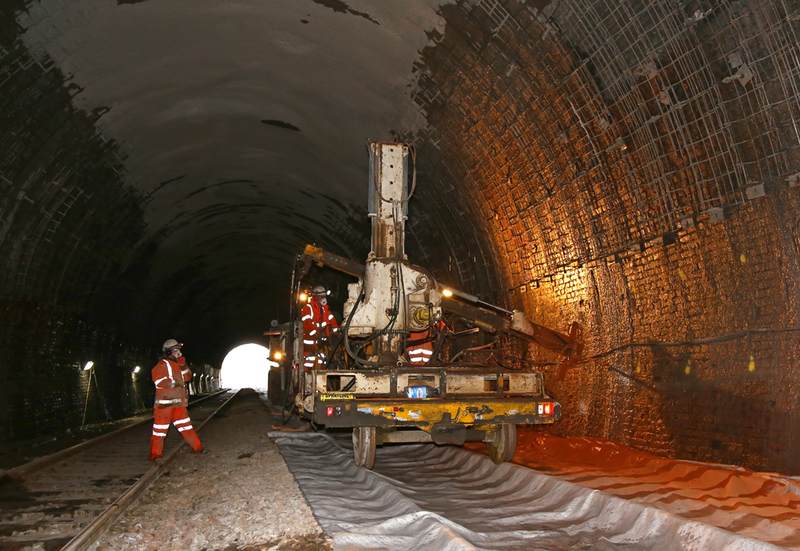 Work has also been carried out to improve water drainage and embankment stability on both the Taunton and Exeter sides of the tunnel. A future phase of works will see the sides of the tunnel receive a similar treatment, in partnership with Amco a new type of train wagon/ platform has been developed, which will allow work to be carried out from the stable platform of the wagon while trains will be able to pass on the opposite line without posing a danger to workmen. The tunnel sides will be treated with a similar concrete spraying meothd to that already applied to the crown of the tunnel arch. 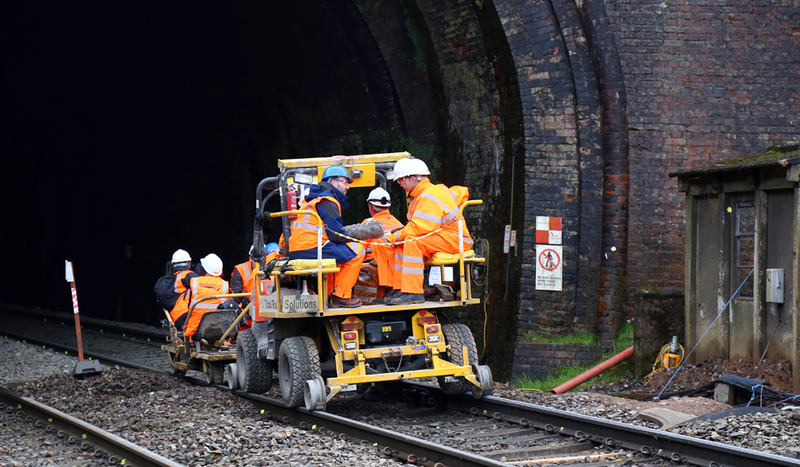 This collaborative effort by Amco and Network Rail have provided a unique solution to allow work to be carried out on the remaining phase without the need to close the mainline again. 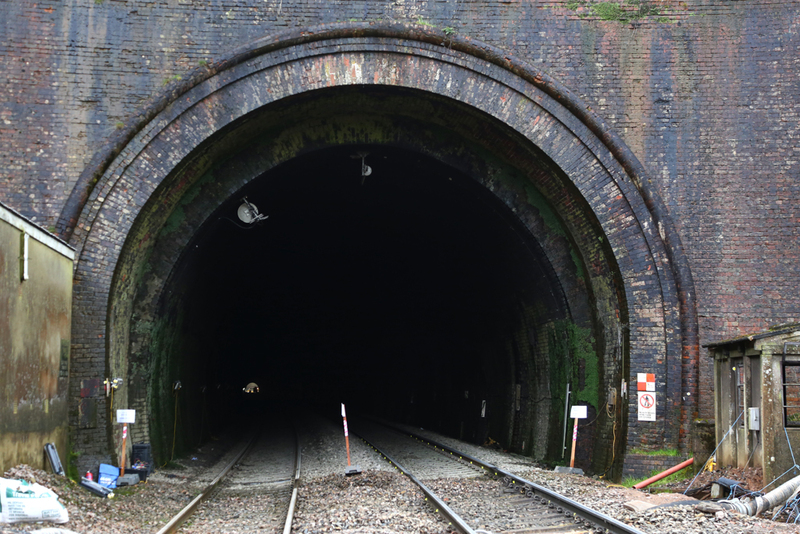 Unfortunately for normal rail passengers, Network Rail were forced to close the line for three weeks between the 18th January until the 9th February in order to carry out this complex piece of work within the confined space of the tunnel. During the three week closure passengers were transferred onto a well organized bus service between Taunton, Tiverton and Exeter, while selected services operated via Yeovil & Honiton to Exeter. 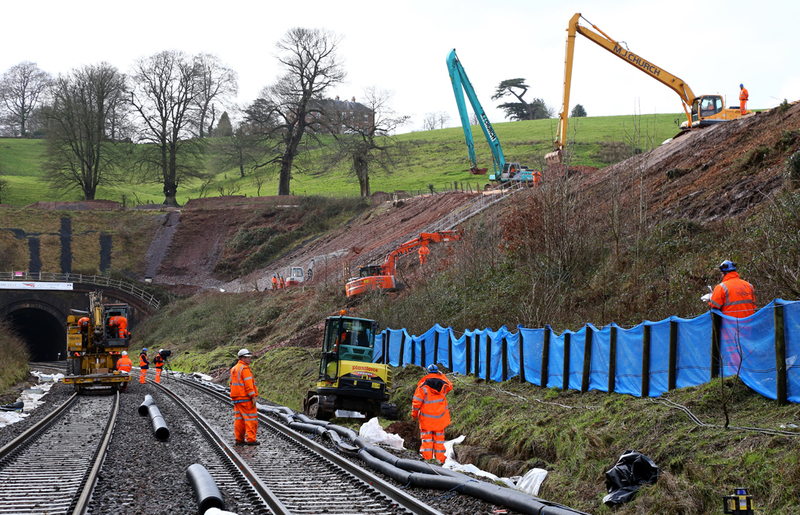 Network Rail saw the closure of the Taunton – Exeter mainline as a positive step to incorporate three separate upgrade projects into one program, this enabled them to tackle the tunnel and the railway infrastructure at the same time, without having to close the railway in the future. Around three miles of track have also been renewed and seven units of switches and crossings relaid separately at Taunton and Tiverton. The upgrade work has been in the planning for over three years, and once complete will enable trains to travel at a higher speed and improve journey times. 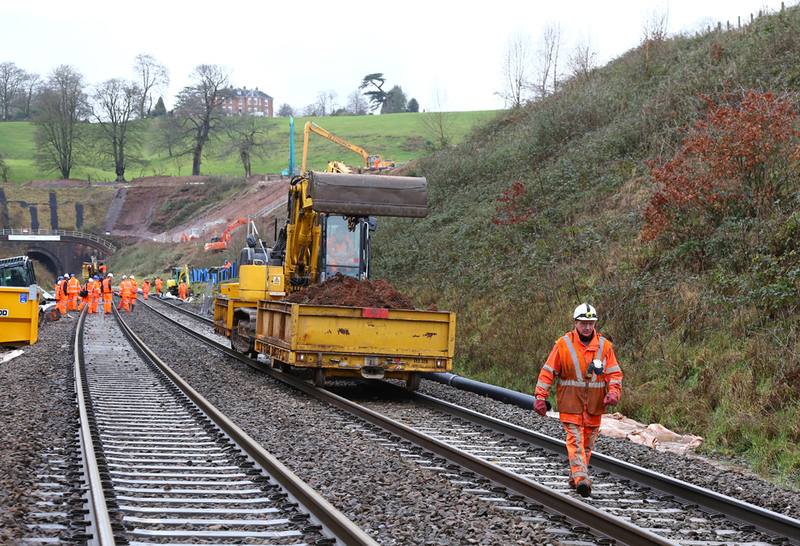 This co-ordinated and efficient effort will significantly help boost rail performance whilst complementing Network Rail’s long-term aspiration to improve services between Bristol and Exeter. 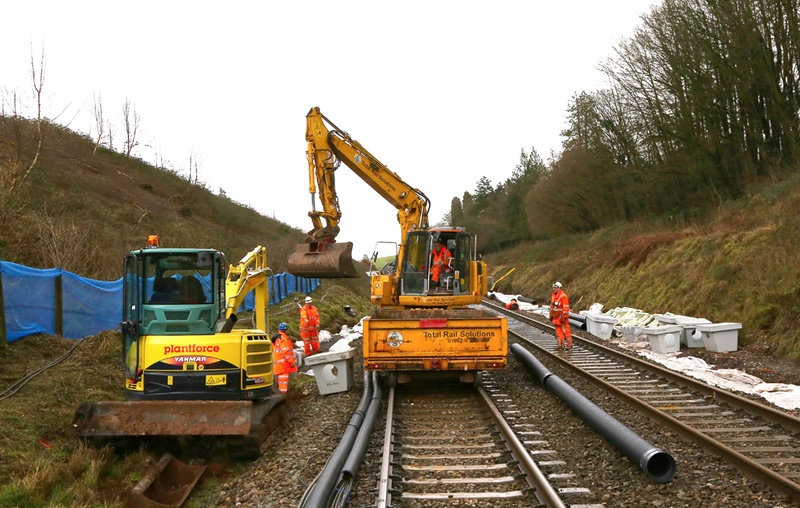 Network Rail’s have invested a total of £15m on the essential upgrade / renewal works. Freightliner Heavy Haul, DB Schenker and Colas Rail Freight have all provided locomotives and ground staff for up to 80 loco hauled services in connection with the various works over the three week period. Contractors on the ground have been commended by Network Rail for working in truly appalling weather conditions in recent weeks (particularly at Whiteball Tunnel). At any one time Amco have had approximately 65 persons on site during each shift, working 24 hours a day 7 days a week. At the time of writing Network Rail were on target to hand back the line to the train operators on time and on budget. A full report on the Whiteball Tunnel Engineering is available in the online Railway Magazine Railway Herald No.396 which was released on the 12th February 2014. View stood on the 'up' main facing West at Marlands. Earth is removed from the worksite and returned to the site entrance for unloading. 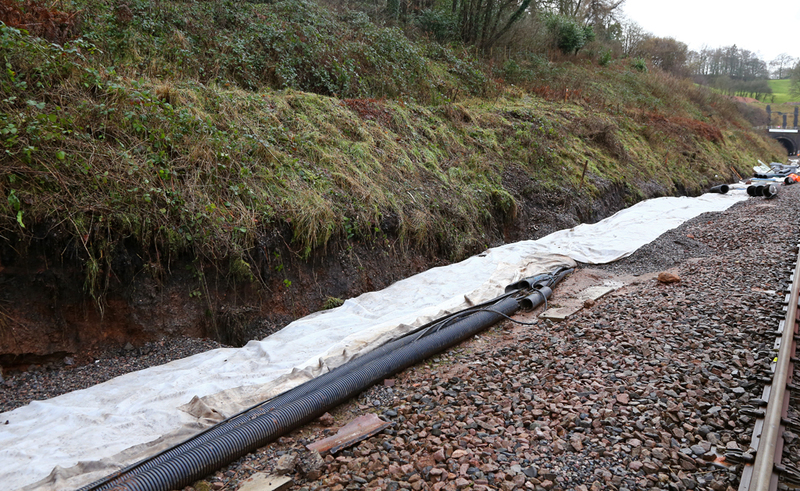 Additional water drainage works carried out at Whiteball Tunnel. This is the view looking at the east portal of Whiteball Tunnel at Marlands. Amco Rail Contractors can be seen working with 'long arm' excavators improving drainage and stability to the sides of the cutting. New drainage channels have also been dug to provide better drainage for the torrents of water currently pouring off the face of the hillside. 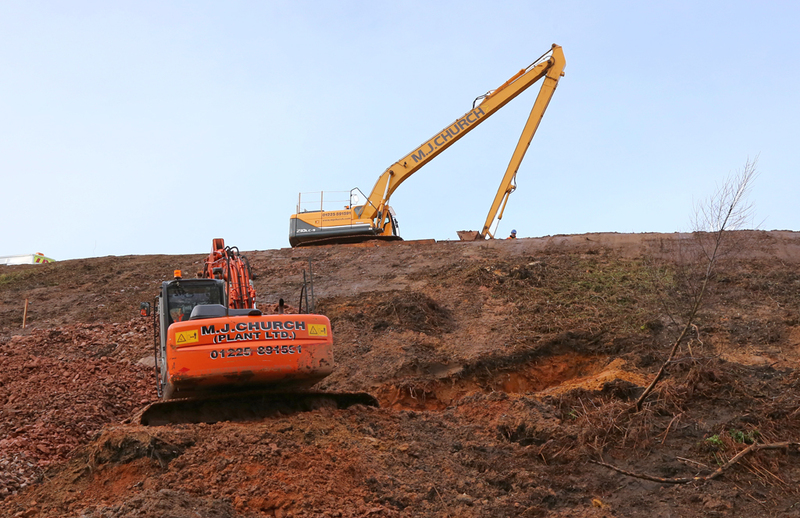 Two excavators stabilize the bank at Whiteball by passing ballast and rocks to one another and then grading the sides of the embankment accordingly. 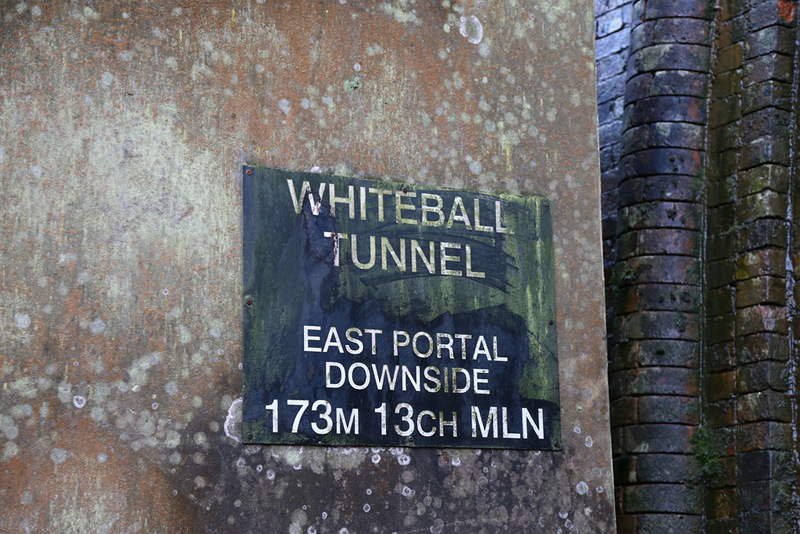 Whiteball Tunnel - East Portal, Downside. 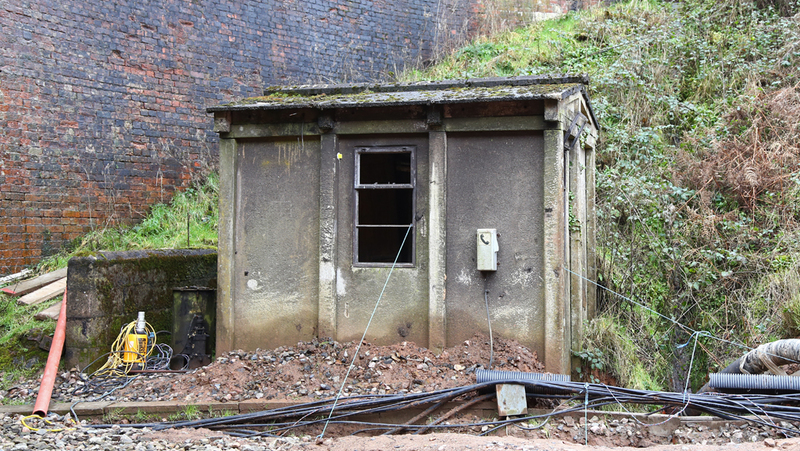 A former workmans cabin/ hut is still in place at the mouth of the Whiteball Tunnel east portal. A road rail plant excavator lays ballast in preparation for newly designed water tanks to be lowered into place. Previously these tanks were manufactured from concrete, but have been re-engineered to be durable and lightweight saving money and reducing complicated manual handling issues. With shot creating complete on the crown of the tunnel a drilling rig is viewed drilling metal studs into the brick arch ready for Phase 2 works where concrete panels and further shot creating will be carried out from a purpose built set of wagons, allowing men to work safely while the opposite track remains open to rail traffic via single line working. A Total Rail Solutions 'Gator' transports media personnel into Whiteball Tunnel to visit the work site. We are also able to provide a video taken from inside the work site exiting Whiteball Tunnel heading north. This was taken while being transported out of the tunnel on the Total Rail Solutions 'Gator', and provides a unique look at a location which is out of bounds at all times! Clearly visible in this video are the works already carried out to the tunnel lining, and also the water which continues to penetrate the tunnel!